On those busy days when you just don’t have time to cook up breakfast before leaving the house, a granola bar can be the ideal grab-and-go food to tide you over. They’re mess-free, easy to eat with your hands, and they hold up well to pretty much any kind of travel. The only problem with this rosy picture is that “granola” is typically a mix of oats and other grains, putting granola bars pretty far outside the Paleo menu. So anything you can get in a box at the store is probably out. That doesn’t mean you can’t make your own, though. 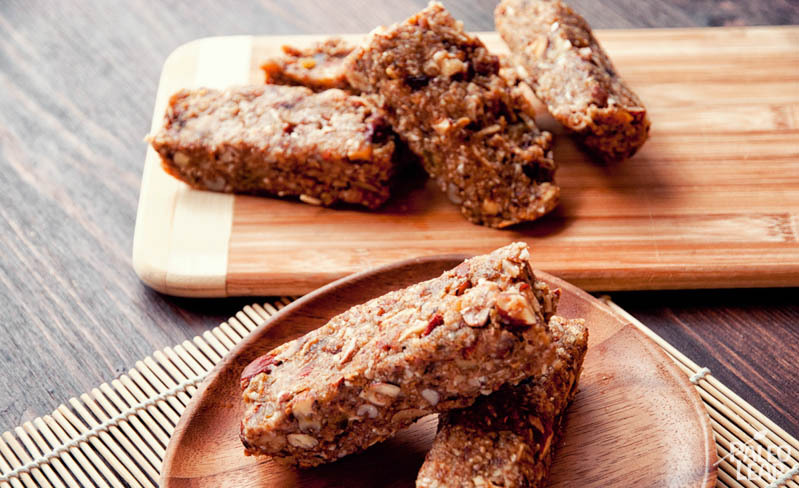 With this recipe, you’ll be making your own, nut-based “granola” bars for the perfect emergency snack or quick breakfast on the go. There’s a legitimate concern with nut-based snacks and treats about the potential overload of Omega-6 fats in the nuts, and also the high amount of antinutrients (especially phytic acid) that the nuts contain. The PUFA is still a factor to consider – remember that these are snacks, not meals – but this recipe takes a big step towards eliminating the phytic acid by having you soak and roast the nuts beforehand. This really reduces the antinutrient content, and it also gives the bars a tender, chewy texture, so you don’t feel like you’re just crunching on glued-together trail mix. Definitely take the time to soak them overnight in salty water and then dehydrate them in the oven: the results are worth it. Because the whole process does take a while, I like to make big batches of these when I cook them up. Just store any extras in the freezer if you aren’t going to use them for a while. You’ll also notice that there isn’t any specific type of nuts called for – use whatever you like. Pecans, almonds, walnuts, or sunflower seeds would all be tasty. Add your favorite dried fruit (raisins? Golden raisins? Cranberries? Papaya? Pineapple?) and you’ll always rest assured that you have a quick and delicious snack ready when you need one. PREP: 15 min. + 24hrs. COOK: 1h. Soak the nuts overnight in warm water with the salt. Drain the nuts and rinse them well in a colander. Place the nuts on a baking sheet in a single layer. Roast the nuts in a preheated oven at 150 F. for 10 to 12 hours. Cool the nuts completely before using. Roughly chop half the nuts using a rolling pin or a knife. In a small saucepan placed over a medium low heat, add the coconut oil, almond butter, honey, vanilla, and cinnamon. Heat until bubbles start to form, and then remove from the heat. In a large bowl, mix the chopped nuts, ground nuts, dried fruit, and almond butter mixture until everything is well combined. Pour the nut mixture into a dish covered with parchment paper and firmly pack the granola mixture tightly, making a single clean layer. Cover with another piece of parchment paper and let sit for 1 or 2 hours at room temperature. Place in the freezer for another hour. 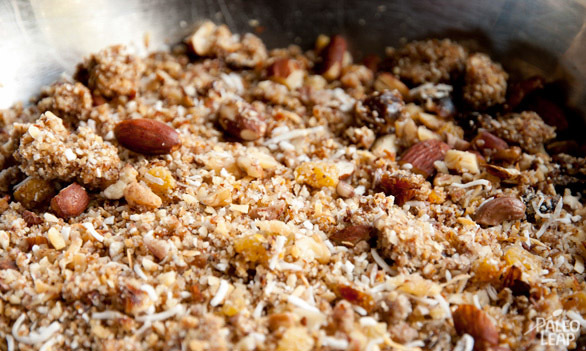 Slice the granola into equal rectangular pieces and serve. Keep the leftovers in the refrigerator.